26-year-old Helena Fernandes likes to draw, but she is not particularly good at it. But did that small detail stop her from opening her own tattoo shop and permanently inking people with her mediocre designs? Of course not! If anything, her poor drawing skills actually contributed to her success. Helen did her first tattoo about a year ago, when she inked her boyfriend for fun. Apparently, their friends found her work appealing, because it was natural and different, and some of them asked her to work her magic on them as well. She bought her own tattooing kit on the internet, and due to the high cost of materials, she started charging for tattoos, investing all the proceeds into better quality supplies. She started working as a professional tattoo artist in March, inking people at a studio she set up at her home. The 26-year-old artist is very open about her drawing skills, but that somehow doesn’t put people off. In fact, the vast majority of her clients sought her out specifically for her unique style. She just draws things on a piece of paper and regardless of how they turn out, she then inks them onto the client’s skin. There are no retries, no touch-ups, just childish doodling that eventually turns into a permanent tattoo. “People are coming to me just because they want something done in my personal style, because if they wanted something super well done, they would look for another tattoo artist. Quality is not my forte,” Helen told UOL. For this reason, she only agrees to tattoo her own designs, because she just wouldn’t be able to reproduce someone else’s drawing, even if it were done in a similar style. 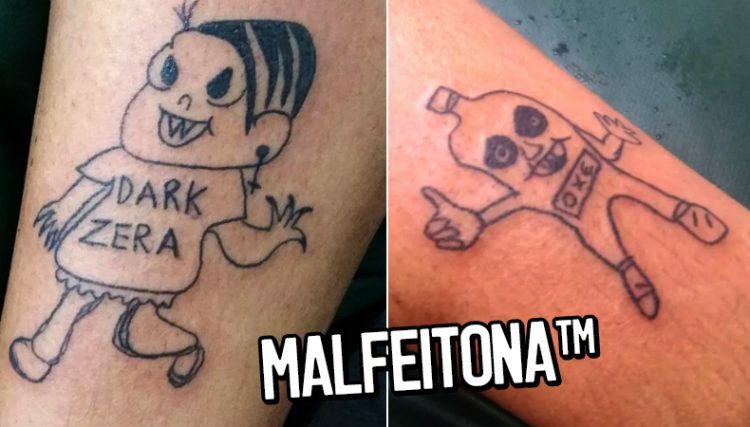 Ever since photos of her bad tattoos went viral in Brazil, Helen Fernandes has been getting some negative feedback from fellow tattoo artists, some of whom accused her of making a mockery of the profession. However, she has always been up-front about her lack of talent. Even the name of her social media handle,”Malfeitona” hints at something ugly. That’s pretty much how it all started. She drew a funny-looking bat on her friend, and their friends were so impressed by it that they wanted similar tattoos as well. She obliged, put photos of her work on the internet, and it just took off from there. She has now created over 50 different designs and people are crazy about them.